California Walnuts, fresh basil, parmesan cheese, olive oil and a splash of cream make up this rich, chunky pesto. Served with pasta and sauteed baby portobello mushrooms! Pesto is one of my favorite sauces for pasta! I make it fairly frequently– especially during the Spring and Summer when fresh basil is it’s best! My pesto recipe is from my mom, and I’m not quite sure where she got it. Most likely from the Pioneer Woman. Anyway, once I started making pesto myself, I realized that the usual nut that’s used in pesto was super expensive. A quick Google search revealed that pesto can be made with walnuts! After the first time I used walnuts in pesto, I never switched back. They’re delicious! My pesto recipe usually calls for just a couple tablespoons of walnuts, but for this recipe I amped up the amount to create a delicious, nutty, chunky pesto. Each serving has a whole fourth of a cup! Walnuts are delicious, and are actually very creamy when they’re blended into dishes. One ounce of walnuts has 2.5 grams of essential plant-based omega-3 alpha-linolenic acid (ALA), and 4 grams of protein and 2 grams of fiber to keep you feeling full. By adding another whole food, sauteed baby portobello mushrooms, you’re increasing the antioxidant power of this dish! Have you made pesto with walnuts? It’s delicious! Boil the pasta according to package instructions. Drain and set aside. In a small saucepan, add the olive oil over medium heat. Add the mushrooms and sautee until wilted. Remove from heat and set aside. In a food processor, add the basil, Parmesan, California walnuts, garlic, salt and pepper. Pulse while adding the olive oil and cream. Blend on low until the mixture is slightly pureed. I like to leave chunks of walnuts! 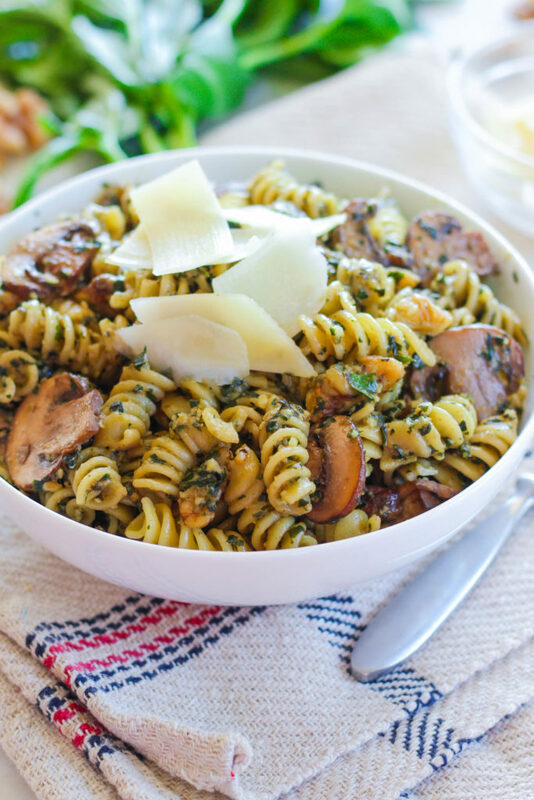 Combine the pesto with the pasta and add the mushrooms. Toss to coat. Serve with additional shaved parmesan. Enjoy! I love all kinds of pesto. Your walnut version sounds delicious! Love everything about this! 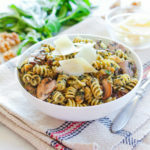 Mushrooms + pesto = delish!! 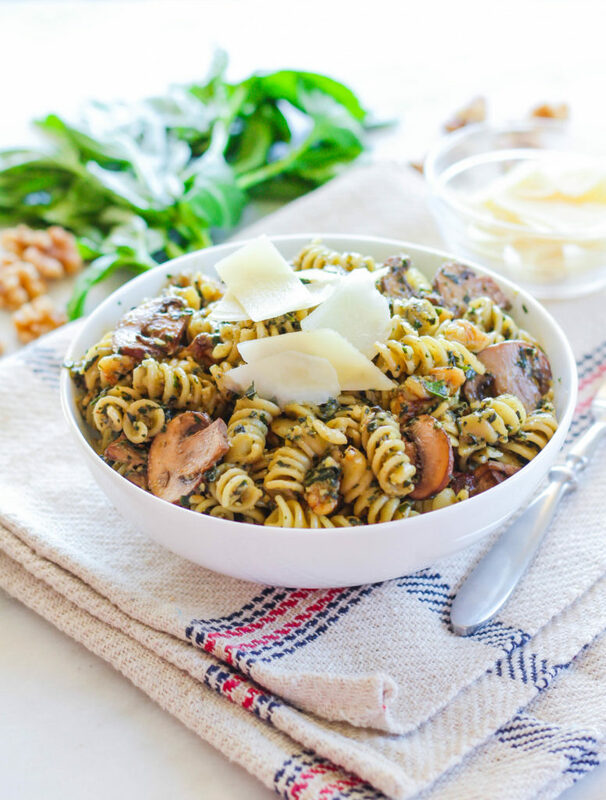 Yes, mushrooms and pesto go so well together!! Oh this is so my kind of dish!! Awesome dish! Though, a little bit complicated I hope I can make it someday. Thanks for sharing! All you need is a food processor and a pot to boil pasta in! 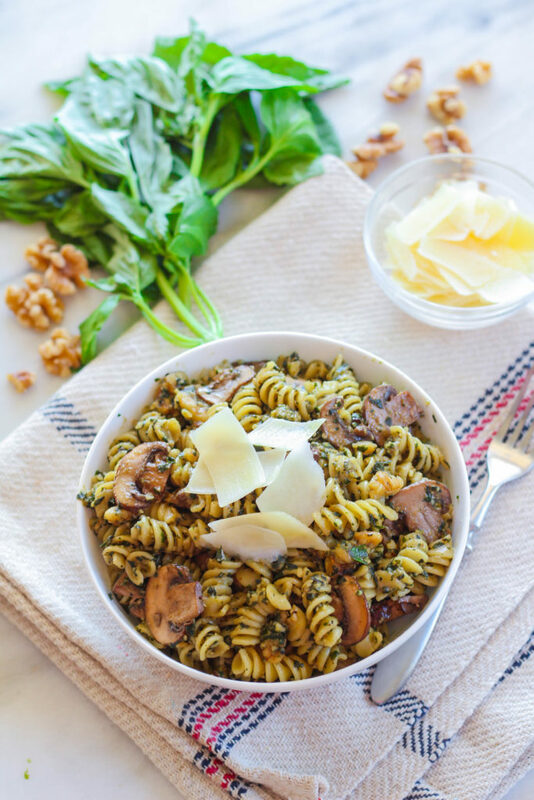 i love pesto in general…and your chunky version sounds ahmazing! Yet another wonderful mushroom recipe to add to my menu… yay! lmk if you try it! This looks amazing! That walnut pesto sounds divine. Can’t wait to give this a try!